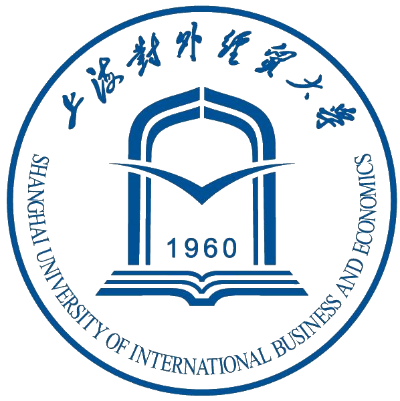 I started my semester in the Shanghai University of International Business and economics (SUIBE) at the end of the month of March. The university is located on two campuses, one in Gubei and one in Songjiang. 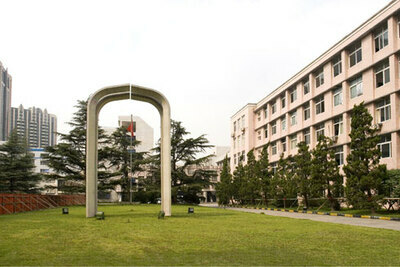 Songjiang campus is the most modern campus, it covers 100 000 m2 of education infrastructure in a dozen of buildings. The weak point of this campus is it is at 1h30 subway from downtown. 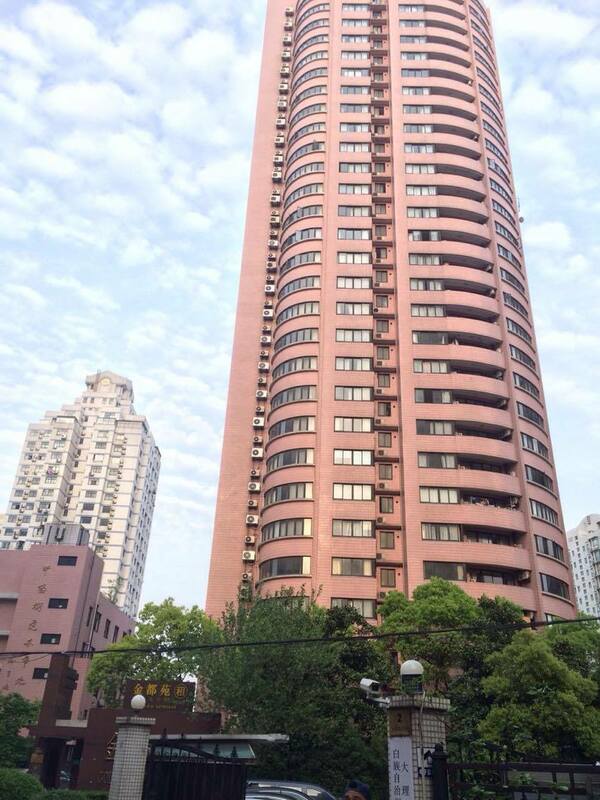 That is why I choose to study in the Gubei Campus which is in the downtown of Shanghai. This Campus is really small but it is enough for study! 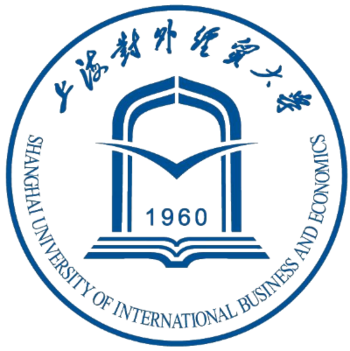 The Shanghai University of International Business and Economics was Founded in 1960. The university consists of 12 schools: the School of Business, School of Foreign Languages, School of Finance, School of Law, School of Management, School of Accounting, School of Tourism and Event Management, School of Business Information Management, School of International Education, School of Continuing Education, School of WTO Research and Education, and finally the School of International Studies of which I am part. SUIBE offers 32 undergraduate programs, covering five fields of disciplines, economics, management science, literature, law and natural science. The university welcomes more than 10,000 students in the undergraduate and graduate programs and some 2000 internationals students in various programs. SUIBE University has been an active player in international exchanges and built a lot of partnerships with more than 80 countries. Concerning the housing, our University proposed some ro om in the campus or single neither double. 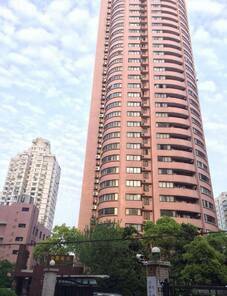 However I chose to live in a flat with my friends because we wanted to be in flat sharing and have a huge and nice place in the downtown of Shanghai. 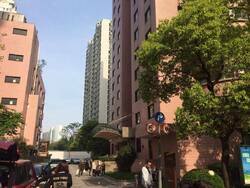 We also found a flat for 5 persons located in Zhongshan Park. This is just from 1 step of metro of the university and this is near Jing’an Temple and People square. The flat is in a building full of foreign student just like us. It’s really a pleasure because we met a lot of people studying in different university in Shanghai. It’s so nice to share our experiences and to hang out with them. What about my first day and the integration? My semester abroad started the 15 of March with the information day. Actually it was more like 1 hour to be aware of the courses that we could choose and their description. That day we have been received by Me Lu, our adviser in SUIBE University. She welcome us very warmly and been really nice to all of us. I have seen all the other exchanges students on my first courses, the 21th of March and at my greatest despair, there have been no integration thinks organized.. It’s really a pity cause because of that, I had no really chance to meet the other students. I think it is maybe because we are studding in the small campus and no in the big on located at Songjiang. It’s must been in here that all the events are set up and where all the student life take place. Our class is composed only of foreign students, mostly of French people but there are also a lot of Dutch and Korean, some German and some American people. The number of students depends on the course but generally we are between 30 and 40 students. So now, let’s talk about the “International Business Program”, basically the main thing why I am here!! 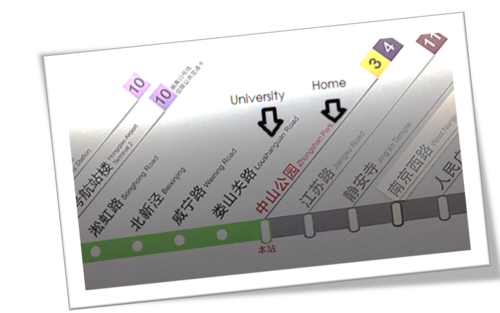 Many courses were offered at my university but the majority were on the Songjiang campus (1h30 subway downtown Shanghai). 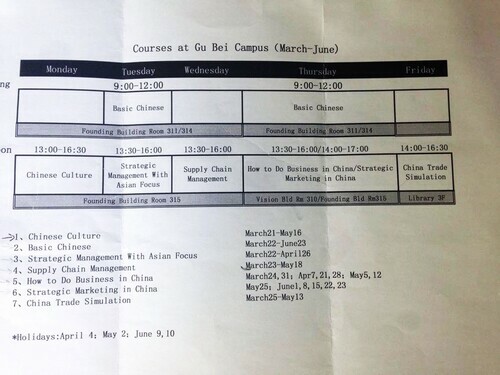 That is why I have chosen to take only the courses offered on the Gubei campus (downtown). To be honest it was not really a choice because I had to take 5 courses and only 7 were offered.. I also took Chinese culture, Strategic Management with Asian focus, Supply Chain Management, How to do business in China and finally, Strategic Marketing in China. Concerning the content of the courses, I have to say that they are all very interesting because these are topics that I never studied in France. In Chinese culture we learn about all the fundamental like the Chinese tea, the Chinese medicine, the Chinese cuisine, the martial arts and so many other. It’s really instructive to understand Chinese life. In strategic Management we studding a lot of case study to see how companies manage their strategy and their goals. Supply Chain management is a courses completely new for me, there we learn how the logistics issues works in the companies. How to do business In China is about all the formal procedure to set up a company in China and how to make it work and finally Strategic Marketing is about to understand how the marketing operates in China. I didn’t take Chinese basics because I thought it was a shame to learn a language so difficult for 4 months knowing that I will not speak it afterwards. "Tai Chi in Chinese Culture class"
We have class only the afternoon from Monday to Thursday so we have a lot of time to visit, travel, hang out and do some physical activities. The ambiance during the class is a little bit disturbing because I don’t actually feel like I was in class, everyone is so relax, they are on their phone, their eat, drink, talk and laugh out loud as if they were at home and the most confusing that is the teacher doesn’t even seams bothered !! I noticed that it was the Dutch people who mostly do that so it’s probably due to a cultural differences because in France nobody would dare acting like that. In China, social life is often played via WeChat, THE most popular means of communication. Everyone in china use WeChat, so it is very easy to organize events and to keep in touch with people that we meet at parties or in everyday life. If you enjoy sport, Shanghai has much to offer. Me and friend wanted absolutely have a physical activities but our university did not offer anything interesting that is why we choose to join a sports hall. 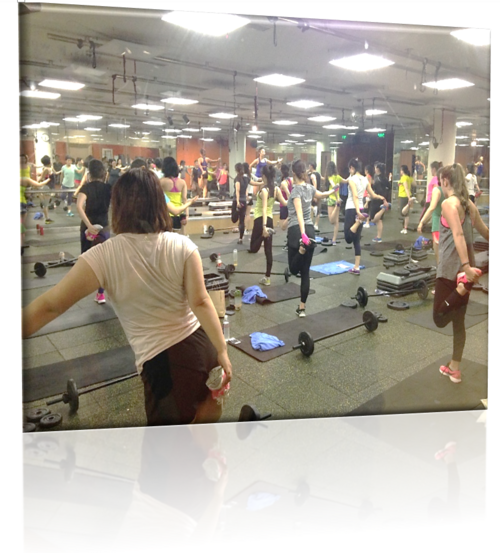 In there we can go to the swimming pool, to gym, to sauna and we can also follow a lots sport course like Zumba, dance, bodybuilding, cycling, Yoga, body combat and so many other. It’s a good way to unwind and to keep fit ! !